Morrison Hotel was located at 15-29 South Clark Street in Chicago and was completed in 1925. This building was designed by Holabird & Roche and stood 526 feet tall with 45 floors. The Morrison Hotel was demolished in 1965 and was the tallest demolished outside of New York. The site of the Morrison Hotel is currently the home of the Chase Tower. 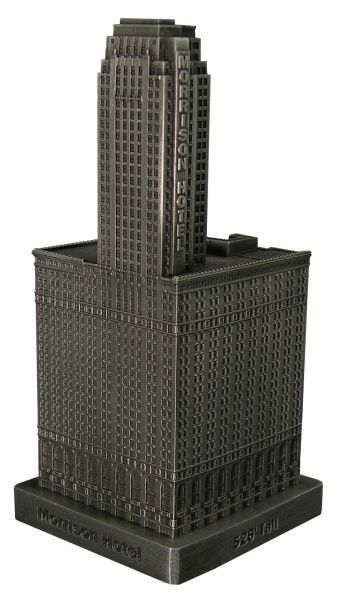 This pewter replica stands a little over 5-5/8 inches tall and is finished in antique pewter. This model's scale is 1 inch = 100 feet. For more pics and info check out our blog. Nice to see this tribute to a long forgotten hotel. The Old Dump Is Back! It is just like I remember. No, I was not there at the opening, but I was a teenager when it was raised. By then it had become something of a dump. This model shows it in its best light. All the archi-bits are there, even the parapet decoration.